Topics: Bradley Spitzer's, Portfolio, Tumblr ♥, ↑ Top, and Behind The Scenes Photos. Its 2 nameservers are ns34.domaincontrol.com, and ns33.domaincontrol.com. Its web server is located at Michael Glenn (New York, York.) 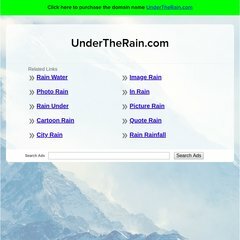 Undertherain.com's IP address is 72.32.231.8.